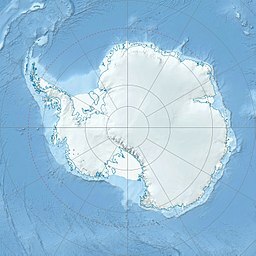 The Pensacola Mountains are a large group of mountain ranges of the Transantarctic Mountains System, located in the Queen Elizabeth Land region of Antarctica. They extend 450 km (280 mi) in a NE-SW direction. Subranges of the Pensacola Mountains include: Argentina Range, Forrestal Range, Dufek Massif, Cordiner Peaks, Neptune Range, Patuxent Range, Rambo Nunataks and Pecora Escarpment. These mountain units lie astride the extensive Foundation Ice Stream and Support Force Glacier which drain northward to the Ronne Ice Shelf. Discovered and photographed on January 13, 1956 in the course of a transcontinental nonstop plane flight by personnel of US Navy Operation Deep Freeze I from McMurdo Sound to Weddell Sea and return. Named by US-ACAN for the U.S. Naval Air Station, Pensacola, Florida, in commemoration of the historic role of that establishment in training aviators of the U.S. Navy. The mountains were mapped in detail by USGS from surveys and US Navy air photos, 1956-67. The Pensacola Mountains were originally continuous with the Ventana Mountains near Bahía Blanca in Argentina, Cape Fold Belt in South Africa, the Ellsworth Mountains (West Antarctica) and the Hunter-Bowen orogeny in eastern Australia. ^ "Pensacola Mountains". Peakbagger. Retrieved 23 May 2017. ^ a b "Pensacola Mountains". Geographic Names Information System. United States Geological Survey. Retrieved 2004-11-03. This article about a location in Queen Elizabeth Land or on the Filchner-Ronne Ice Shelf is a stub. You can help Wikipedia by expanding it. This page was last edited on 10 April 2019, at 07:40 (UTC).